Depending upon the vessel, microgreens are grown by two distinct techniques: Container Gardening and Tray Gardening. On this website, you will learn all about Container Gardening. 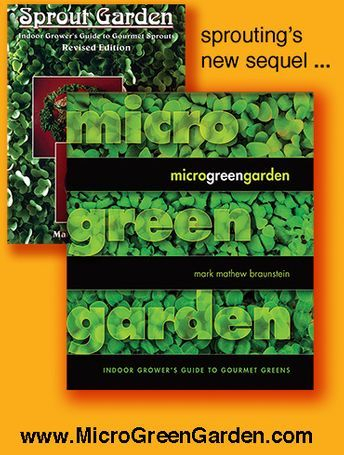 (For Tray Gardening, please consult my book Microgreen Garden.) Let’s start by filling a container with soil. But what soil to use? And why use soil at all? As leaves reach up for sunlight, roots reach down for soil. Yet just as you might switch on an electrical light to substitute for sunlight, you can provide alternatives to soil. You might consider hydroponics, in which roots bathe in dilute liquid fertilizers. Rather than anchor in soil, roots latch onto cloths made of natural fibers such as coir (the fuzzy lining inside coconut shells) or burlap (made from jute, and called baby blankets when marketed for gardening), or onto plates and bowls woven of bamboo or straw, or onto synthetic foam pads woven of the same polyethylene (PET, recycle number 1) plastic from which most food containers are made. More natural growing mediums include rock wool, volcanic cinder, crushed granite, and inland sand, but these can be messy. In addition to hydroponics, newer techniques include aeroponics (constant misting), bioponics (underwater aquaponics for plants), and vermiponics (compost tea and worm castings). Hydroponics and all these other soil-less techniques require a costly startup, a bulky setup, a manmade mindset, and stews and brews of supplemental fertilizers that seldom are organic. When water-soluble fertilizers are organic, they usually are composted pee and poop and blood. And the factory-farmed animals who are doing the peeing and pooping and bleeding are conventionally-fed and chemically-drugged. Yum! 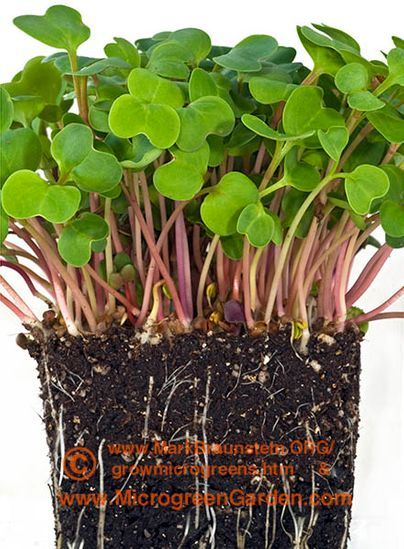 Grown upon coir or burlap or bamboo or straw or polyethylene without any boosts of nutrients, microgreens slacken their growth rate to a crawl and become stunted or dwarfed, or when they do look nearly normal they taste either bitter or bland. So in the absence of soil, liquid fertilizer indeed is needed. Except for fostering a high incidence of mold, polyethylene foam pads and liquid fertilizers have proven very successful for growing microgreens. Thus, as a worthy alternative to using soil, hydroponics deserves further consideration. But that must wait for another day. This chapter is about soil, and this book is as much about growing microgreens as about living in harmony with Mother Earth. Fortunately for both us and for farm animals, microgreens do not need much fertilizer regardless of source, so the meager dosage of nutrients inherent in simple soil is both sufficient and dirt cheap. Some seed vendors list for each species of seed its vital statistics such as germination time, temperature range, harvest length, and what they call preferred growing medium. Preferred by whom? By us, or by seeds? Seeds prefer soil. Seeds are native to soil, and all their ancestors had their family roots in soil. So be happy digging in the dirt. Just don’t call it dirt. Soil may be soiled, and earth certainly is earthy, but only dirt is dirty. An image you may conjure for soil may your outdoor garden’s fertile top layer, called topsoil. Starting at ground Zero and the year One, over the course of many years you may have enriched it with kitchen scrap compost, with rock dusts, and with horse manures. (Compared to factory-farmed animals, horses are raised humanely and on fewer drugs, so their manures less likely repositories of antibiotics and hormones.) For growing microgreens, your first inclination might be to unearth this earth, and to haul it indoors. But hold your horses! Once dug up, topsoil cakes up. Spread into a thin layer it hardens like pie crust, or dispensed into a small container it compacts like a muffin. Caked soil blocks air, so roots can suffocate. As a remedy, commercial seedling mixes contain perlite or vermiculite, which granulates and breaks up the soil, and peat moss or milled sphagnum peat, which makes the soil light and spongy. Peat also is naturally fungicidal. With spores everywhere including underground, fungi can grow on seeds or on their emerging roots and stems. A broad range of fungal diseases collectively called “damping-off” can cause seedlings to rot at the soil line and keel over. Also troublesome, topsoil brought indoors may hatch little crawling critters or introduce weeds and microorganisms among your microgreens and into your home. To reduce the risks of critters and contamination, commercial potting soils or seedling mixes are pasteurized or sterilized. Just as you hunger for grow-your-own microgreens, you may feel inspired to grow them on your own do-it-yourself potting soil. To use soil from your own yard or garden, you can sterilize it by baking it in your oven. * Recipes loosely adapted from George and Katy Abraham’s book Organic Gardening Under Glass (Van Nostrand Reinhold, 1984). Potting soils sometimes boast the moniker “organic,” which opens a can of worms. Avoid “forest compost,” a euphemism for wood chips and twigs. And beware so-called “organic” amendments from the factory farm and slaughterhouse. Urea (pee), manure (poop), blood meal, and bone meal all can come from animals that are neither fed organically nor raised humanely. And feather meal and chicken and turkey litters originate from the most diseased of all factory-farmed animals. Such litter consists of coop poop and occasional body parts in a base of straw, sawdust, wood shavings, or seed hulls. The litter is laced with pesticides added to turkey and chicken feed so their poop will not attract insects, yet such poop once composted is ordained USDA Organic. Organically groan. Organically or not, plants grow in many stages and grow many leaves. Microgreens comprise the two earliest leaf stages, cotyledon (called also seed leaf) for the first one or two weeks, and true leaf thereafter. (For more about this, leaf ahead to the chapter titled Fruition & Harvest.) Most commercially grown microgreens are cultivated to true leaf stage with twice the size and weight as seed leaf stage because market competition dictates high yield harvests. You, however, dwell outside that marketplace. You can grow your microgreens only to the more succulent seed leaf stage, in which case seedling mixes provide ample nourishment. Growth for ten days or fewer is simply too short a time to fully utilize fertile soil. Beyond ten days, potting soil is recommended. Just how fertile should soil be? This timetable is imprecise as it varies according to seed species, soil fertility and quantity, and seed density sown upon the soil. All affect the rate of soil depletion. Rather than agonize over whether to use seedling mix or potting soil, you always can use potting soil. Simple! To sum up: while many soil and soil-like mediums can suffice, seedling mixes and potting soils are recommended. If you wait to saturate the soil until it is placed into the container or tray, much water will run off and onto your kitchen counter and floor. So first place the soil into a bucket and stir in water, but not so much that puddles form on the top or a pool forms on the bottom. During this stirring experience, remove leaves or twigs or wood chips or any other Unwelcome Fibrous Objects (UFOs). In between batches, as a safeguard against mold allow the empty bucket to dry out and remain dry for at least one day. Be aware that, except for light, the same components and conditions that promote the growth of plants equally foster the growth of mold. But be assured that with due diligence you can stay one step ahead of mold and nip it in the bud. Most solid amendments to soil such as compost or humus or powdered kelp or pulverized minerals or ground shells are akin to time-release pills that do not have enough time to do much releasing during the one or two weeks of seedling growth. Thus such boosts accelerate microgreen growth only slightly, if at all. Achieving the same results in 13 days rather than two weeks provides some financial incentive to professional microgreen farmers, but hardly need concern you. Water-soluble liquid fertilizers can yield more immediate results. Liquid kelp extract is among the best, and probably the cheapest. And yet, too high a concentration of even kelp can inhibit germination, which is why it is marketed as a foliar spray intended for application to the undersides of leaves. Even then, it is possible to apply too much spray. And if you prepare too much at once, the solution spoils very quickly. So if you do add boosts to the soil, do so very sparingly and during only this initial saturating of the soil. Anything afterward is too much, too late. To sum up: adding liquid nutritional boosts to the soil is optional, probably unnecessary, and potentially harmful. Scoop the soil into the container or tray. Do not pack it, but do fill it right up to the brim. Consider filling the bottom half with potting soil and the top half with seedling mix. In time, you can experiment growing with all potting soil, with all seedling mix, with different layers or proportions of both, and with different sources for either. But for a start, half potting soil and half seedling mix offer the best of both worlds, with which you now are prepared to explore a whole new world.